Peter is the country's leading market maker for large size currency and high denominations. Manning is a national banknote expert and has handled many headline making discoveries over the past ten years. Brad is a former PMG grader and an authority on national bank notes, confederates, and obsoletes. We Are Buying, Contact Us! Stack's Bowers has been holding coin and currency auctions since 1933. 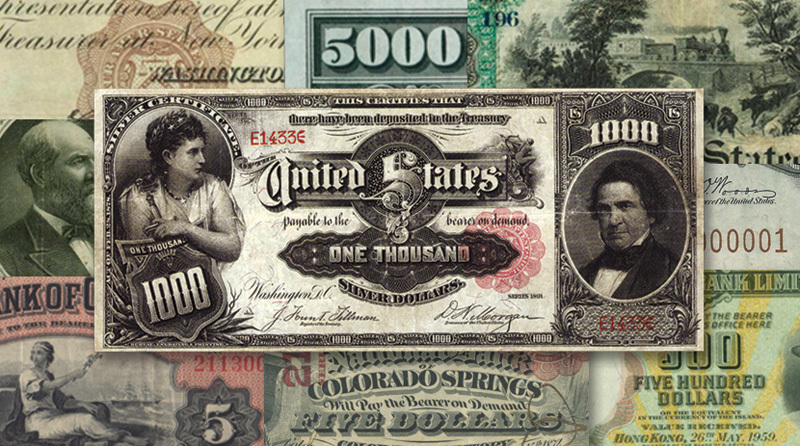 As the oldest numismatic auctioneers in the country, we have had a chance to handle virtually every rare and meaningful banknote in the paper money hobby. We hold four large multi-million dollar currency auctions each year. Anyone can consign to these sales. They are held in conjunction with major collector shows across the country. We are always looking for large and small size currency, national banknotes, obsoletes, confederates, fractionals, MPCs, errors, and colonials, as well as rare Canadian and foreign banknotes. We can grade and put your single banknote or entire collection in front of thousands of the most interested collectors, dealers, and museums in the country. Please contact us today to learn more about our very low seller rates. Stack's Bowers currently holds the world record private sales price for a banknote. In 2013 we sold an 1891 $1,000 silver certificate for 2.6 million dollars. Every year we buy and sell privately more rare currency than any other firm in the world. We would be happy to take a look at and make an offer on any old currency you are looking to sell, even if you don't want to auction them. We provide paid appraisals for individuals, estates, banks, attorneys, museums, and government bodies. Our director of currency auctions is the only full time currency dealer who is also a certified member of the International Society of Appraisers.